Advanced Practice in Healthcare outlines the key components of advanced practice in which healthcare professionals are engaged. With a clear skills focus, it explores issues critical to providing effective enhanced care to patients whilst managing and negotiating the complexities of the healthcare delivery system. Provide guidance on the development of clinical skills, including consultation, clinical decision making, holistic care, and the role of care planning in advanced practice. Explain management skills and how to manage, negotiate and monitor the complexities of the healthcare system in order to ensure the delivery of quality patient care. Clarify the professional role of the advanced practice clinician and how implementation of the role can improve the delivery of patient care. In each chapter activities are presented that assist in the development, implementation and extension of advanced level practice. This text is especially relevant to nurses, midwives and allied health professionals practising within primary and secondary care who wish to advance their practice or clarify their roles within the context of advanced practice, particularly those undertaking masters level study. ‘What has been missing for many is the opportunity to develop professional and managerial skills which will allow them to facilitate change and impact on health service policy and provision in their area of practice. 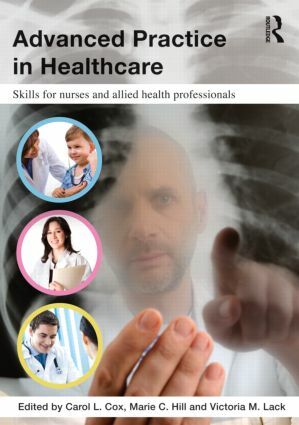 This book addresses the professional skills and knowledge needed by these practitioners to ensure they can function effectively and efficiently in the variety of healthcare settings in which they practice, and consequently empower them to develop healthcare services which truly meet the needs of their service users. This text will be an essential resource for those already working in the advanced practice setting but will also inspire the nurse practitioners of the future. I certainly wish this text had been available to support me in my role development 20 years ago!’ – Theresa Porrett, PhD, MSc, RN, Nurse Consultant in Coloproctology and Clinical Director, North East London Bowel Cancer Screening Centre, UK. 'This title is well written and appears to be well-referenced. What is particularly pleasing is the standard layout adopted by all of the contributors, making it easier for the reader to navigate the book. The use of learning outcomes listed at the beginning of each chapter is particularly helpful.' - Phil Jevon, Medical Education Multi Professional Skills Manager, Walsall Healthcare NHS Trust, Manor Hospital, UK. Carol L. Cox is Professor of Nursing and Advanced Clinical Practice at City University London, UK. She established the first Advanced Practice Master of Science Degree Programme there in 1997. Carol presently leads the Advanced Practice Master of Science Degree Programme at City University London, is the Research Lead in the Department of Applied Biological Sciences and also works as the Nursing Research Lead at Moorfields Eye Hospital NHS Foundation Trust in London. Marie C. Hill is a Senior Lecturer in Practice Nursing at City University London, UK. Her academic career at City University London spans over 10 years. Marie’s expertise is in the area of developing curricula for Practice Nurses. A British Council award led to a successful collaboration between City University London, Queen Mary University of London and the Medical Academy of Postgraduate Studies in St. Petersburg, Russia. Marie led the team in delivering a master’s level module to Practice Nurses in St. Petersburg. Victoria M. Lack is a Senior Urgent Care Practitioner at Harrogate District Hospital, North Yorkshire, UK. She qualified as a Family Nurse Practitioner in Boston, USA and also holds a PGDip in Academic Practice. She established the MSc Primary Care Advance Practitioner route at City University London in 2005.